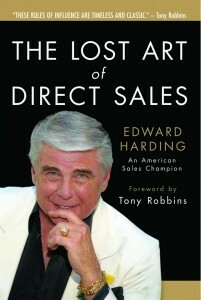 While there are motivational chapters in my book “The Lost Art of Direct Sales”, this is chiefly focused on the “art” of selling. I believe sales is a ‘profession not a job’ which I am openly honored to be a part of, and I am a devout believer in sales as a career of service and if you will get in it, which I point out in my book, more than once, that it also happens to be the “highest paid profession in the world.” My own successes – running the gamut from direct sales to financing to real estate investment and management – are because I made sales my sole profession. Dan Vega, Entrepreneur and TV Talk Show Host, known as “America’s #1 Results Guy”, calls the book “the most complete and practical sales guide I have ever read.” It is available on Amazon, if you want to pick it up. Please take time to read it and let me know what you think. I am sincerely interested.